No need to travel far to hear some funk and groove, The Dip sizzles with soul right here in Washington. The Seattle-based group, which includes members from Bellingham, deftly channels jazz and funk giants such as James Brown, Lee Fields, Charles Bradley, and Sharon Jones. In fact, the band name—The Dip—is inspired by Sharon Jones’ song “The Dap Dip,” off of Dap Dippin’ with Sharon Jones and the Dap-Kings. “It’s kind of a running joke that our songs are saucy,” bass player Mark Hunter explained. The band wanted the name of the group to be food-focused, yet still relate to music. And indeed, listening to their songs can make the listener forget they’re in the Pacific Northwest and instead somewhere warm, perhaps down south, grooving to funk masters Papa Grows Funk or Dumpstaphunk. Though the name is short, the group is large. There are eight musicians (they lost a keyboardist to grad school in Germany), as well The Honeynut Horns, a detachable unit that sometimes gigs separately from The Dip. Tom Eddy plays guitar and vocals, Jarred Katz is on drums, Mark Hunter plays bass guitar, Jacob Lundgren is on guitar, Sam Hylton is on keyboards, and Austin Strand plays the congas and percussion. The Honeynut Horns is comprised of Brennan Carter (trumpet), Levi Gillis (tenor sax), and Evan Smith (baritone sax). The sheer size of the group elevates the energy level in the room and ensures that everyone is in on the shared experience. Hunter and Katz formed the band in 2012 out of a need and desire to play house parties in the U District surrounding the University of Washington in Seattle. The members all met at UW while studying jazz so it seemed a natural fit. So natural, in fact, that members from The Dip also formed Beat Connection, an electronic pop group that played at the Wild Buffalo last December. There is no rest for these guys; the band is basically a full-time job and each member of the group is involved in at least one or two other side projects. “We’re pretty much taking any opportunity we can get,” Hunter said. The group released Premium Northwest Soul, an EP they self-recorded and released in the fall of 2013. They are currently working on 11 tracks for their newest album (they haven’t decided on a title yet), which will be released sometime this spring. So far “Ready to Go,” a single released last fall from the new album, has enjoyed wide success. They have performed for packed audiences all around Seattle, and they played a sold-out show at the Green Frog in Bellingham last winter. 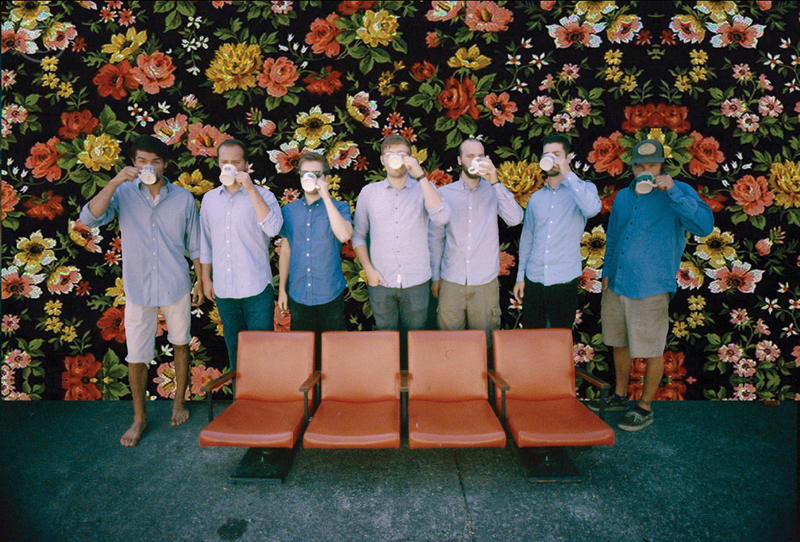 They have opened for the California Honeydrops, wowed the crowd at the Northwest Folklife Festival, and opened for New Orleans’ famed Dirty Dozen Brass Band at Neumos. Of their opening performance for the Dirty Dozen Brass Band, Hunter said it was “a little intimating.” But the band also learned a lot about presence and music from that experience. “They groove superhard,” Hunter said. Because the band members all studied jazz, there is an underlying jazz current that runs throughout their music. They aspire to be more composed and not as open-ended. The band prides itself in its creative writing process. Many of the songs come about through collective composition. Someone starts off a groove and then, one by one, each member adds their own flare to it. The results are usually favorable and the songs end up sticking. But sometimes a member will bring in their own demo for the band to tweak and adopt as its own. As for future plans, The Dip would love to play along the West Coast. Beat Connections is already signed up to play SXSW 2015. But for now, the focus is all about getting the new album finished, mixed, and printed to vinyl. They are playing at the Wild Buffalo on Feb. 14. The first set will include songs from their EP as well as the new album. The second set will be a cover of songs from Sharon Jones’ album Naturally. “We thought it would be a good exercise to cover the kind of music that we’re trying to recreate,” Hunter said. And what a perfect way to spend Valentine’s Day! LIVE SHOW: Check them out at the Wild Buffalo on Feb. 14. For more info about the band, see their Facebook page (facebook.com/thedipmusic).